THIS WEEK’S OTHER FEATURED BOOKS, “FOREIGNER,” BY NAHID RACHLIN AND “THE RETROACTIVIST,” BY NATE RAGOLIA, CAN BE FOUND BY SCROLLING DOWN BELOW THIS POST, OR BY CLICKING THE AUTHOR’S NAME ON OUR AUTHORS PAGE. SUMMARY: Martín Silva de Choc, childhood survivor of an army massacre during the Guatemalan civil war, and now a language-school teacher in Guatemala City, falls in love with his American student, Abby, and follows her home to Chicago on a fiancé visa. Days before their wedding, however, Abby goes missing, and on a Halloween afternoon Martín embarks on a search that leads from the ghost-strewn yards of Chicago’s North Side to the Lincoln Park Conservatory—and ultimately back to his violent past. A story about repressed secrets and the limits of love, Day of All Saints traces the effects of historical trauma on individual lives. THE BACK STORY: I got the idea for Martín, my protagonist, soon after I moved back to the U.S. from Guatemala, years ago. 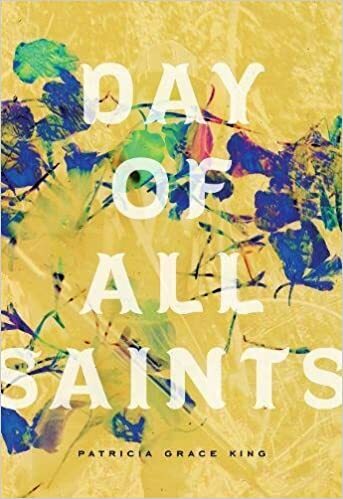 In Day of All Saints, Martín is a Guatemalan who has just arrived in the States and who finds it a strange place on some levels. The book began with this character, Martín, with my wondering about how different aspects of American life might seem to a newly arrived Guatemalan. I often listened to the oral testimonies of civil war survivors. Those stories – and the courage of their tellers – have remained with me for decades. They’re such important stories, too rarely heard, and in Day of All Saints I wanted to give them another hearing. WHY THIS TITLE: The story takes place across one Halloween afternoon. In the U.S., Halloween is celebrated quite exuberantly; in Guatemala, it’s barely recognized. (And so it’s another thing that freaks Martín out.) The holiday that matters much more in Guatemala is November 2nd, Day of All Saints. While both Halloween and Day of All Saints have to do with ghosts and the dead, I wanted to explore the contrast between the U.S.’s fun- or thrill-centered celebration and the more solemn rituals in Guatemala. WHY SOMEONE WOULD WANT TO READ IT: I think stories at their best provide bridges into other lives, other worldviews, other cultures. That’s not their only function, of course; ideally, they should also entertain us, or move us with their beauty. But in this current moment and in the foreseeable future, my hope for Day of All Saints is that it might increase or encourage compassion for the outsiders in our midst, wherever we are. AUTHOR PROFILE: Patricia Grace King grew up in North Carolina’s Appalachian foothills, the granddaughter of Mennonite preachers on both sides of the family. After moving to Spain at nineteen, she became addicted to travel and has since lived in various parts of Central America, as well as in Atlanta, Chicago, and Virginia’s Shenandoah Valley. She also spent a year traversing Canada and the U.S. with a public art display. Guatemala, where Patricia lived for three years—as an accompanier of refugees with Witness for Peace during the civil war, and later as a language school director—is the setting for much of her writing. Patricia’s first book, Day of All Saints, won the 2017 Miami University Novella Prize and was shortlisted for the 2017 Balcones Fiction Prize. Her two chapbooks, Rubia and The Death of Carrie Bradshaw, respectively won The Florida Review’s Jeanne Leiby Memorial Contest and the Kore Press Short Fiction Award. Her stories have been published by Ploughshares, The Gettysburg Review, Narrative Magazine, Nimrod, and other journals. She holds an MFA from Warren Wilson College’s Program for Writers and a Ph.D. from Emory University, where she was a Dean’s Teaching Fellow. She was the 2013-2014 Carol Houck Smith Fellow at the Wisconsin Institute for Creative Writing and has been awarded additional fellowships and grants from the Vermont Studio Center, the Barbara Deming Memorial Fund, and the Illinois Arts Council. Patricia lives with her husband, David Janzen, in Durham, England, where she is completing a novel as well as a story collection and has become a big fan of mushy peas.